Papa Johns hit repeat on this deal! Combine deals today at Papa John’s to get a heck of a deal on pizza! You could get six one-topping pizzas for $25, or get two one-topping pizzas and three specialty pizzas for $25. First, buy a $25+ gift card at Papa John’s and they’ll email you a special code for a free large pizza. I received mine in my email within minutes. **Check update below for an even better Groupon deal! Once you have the code for the free large pizza, go order tonight’s pizza. 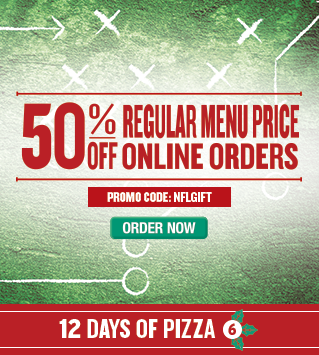 Stack that freebie code with code NFLGIFT and you’ll get 50% off the rest of your order. Then, use that gift card you just bought to pay! How about that for some cheap pizza?! This offer is available today only, 12/18. I did this last night and had to make two orders for carry-out. I just checked my email and saw there is a Groupon available for Papa John’s as well. Buy a $25 voucher from Groupon and you’ll get TWO free large one-topping pizzas. You’ll get three emails with three different codes – two for the free pizzas and one for the $25 voucher. It’s unclear whether you can redeem the two free pizzas in one order. You can always make two orders (especially if you’re doing carry-out), or save the extra freebie for next time. Use the $25 voucher as payment.